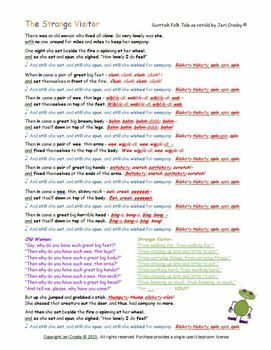 This favorite musical folktale will delight and engage your students! This set includes a six-minute MP4 recording (playable and burnable on most computers), the script in black and white and color-cued formats, two pages of visual aids, a teaching guide, and rhythm strips for exploring and composing with the rhythms in the story. Depending on whether you use this as a literacy activity or literacy/music integration with composing activity, teaching time can vary from 20 minutes to an hour. The recording works well for a listening center, for introducing the class to the story, or simply as a model to help the teacher get familiar with the story. If you are a regular classroom teacher, the reading, singing and play-along activities will help build fluency and affinity for literature. (Deep musical skills are NOT necessary, but of course, you will want to sing the short melody and tap or play rhythm patterns based on speech/onomatopoeia.) Creating a soundtrack for this story is easy and a great integration. 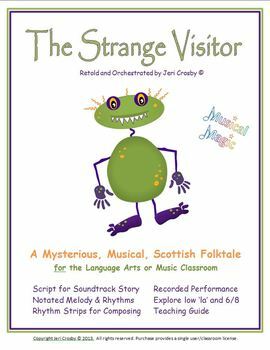 If you are a story teller, you'll love this version of "The Strange Visitor," AKA "Strange Company." 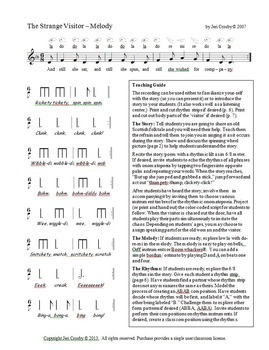 If you are a music teacher, this is an excellent (and fresh) piece for exploring low 'la' and six/eight meter. Easy-to-play rhythm strips based on speech patterns in the story are a great way to engage students in practicing and composing in 6/8. 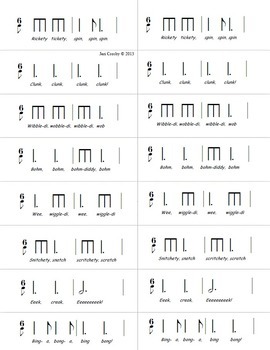 Solfege hand signs are included with the melodic refrain. This folktale is great any time of year, and especially fun at Halloween.